This black slat wall shelf is our wider, 12"d x 48"w shelving option. With this width, these long shelves are an appropriate fit for the front and back panels on our black H-gondola, SWH49EBK. The slat wall shelf is constructed from solid melamine, making a sturdy surface for your retail merchandise. Set-up is easy, too! In just minutes, hook our 12" metal brackets (sold separately) to the slatwall panels and place the shelves on top. We recommend using 3 brackets to give your shelves added support. The slat wall shelf is finished in black to match nicely with most store interiors. 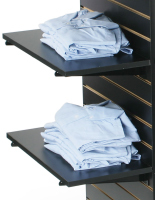 Create a display for your clothing, food, accessories, school supplies, or any other moderately heavy retail item. Use these melamine shelves and our other accessories to configure a complete store display! 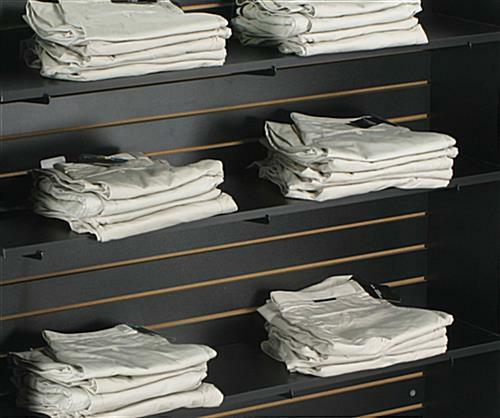 A slatwall display provides you with a quick , dynamic, and most of all affordable store fixture. 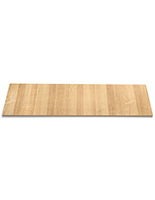 48.0" x 0.75" x 20.0"